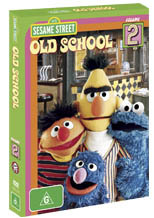 It's hard to believe that Sesame Street has been around for so long and this current DVD focuses on some of the classic the episodes during 1974 to 1979 that brings together some of the most memorable highlights. Sesame Street was also quite revolutionary at the time as it was one of the first edutainment series on television that not only kept children of all ages entertained but taught them a variety of things from mathematics to colours and even spelling. Compared to the modern incarnation of Sesame Street, the series was quite grass roots based on the 70's format that included over the top characters and some really great looking "home made" puppets. Apart from the humour in the series, the original series featured a plethora of guest stars that included Judy Collins, Henry Winkler as his alter ego Fonzie, Richard Pryor and the extremely talented Ray Charles who really gives his utmost in his classic episode. It's quite amazing how many guests were featured in this series, although my favourite was the Star Wars one. This collection features the Sesame Street test show 1 which is a great insight into the original series and how it may have panned out today plus a variety of Sesame Streets inspired Easter eggs. It's a shame about the video and audio quality, however considering the age, it's understandable. This definitely brings back a variety of memories and although kids of today, more specifically the younger ones will enjoy it, it seems like this DVD has been collected for the older viewer in order to travel down reminiscent lane. Definitely a fun collection! * Episode 666 (6th season premiere), originally aired November 4th, 1974. Relive the groovy days of retro Sesame with Counting Lights; Enter and Exit; Africa; What's the Name of that Song? ; Bert & Ernie: Scary Movie; Beetle Bailey; First & Last Pencils; Frog Struggle. Featuring the hilarious Snuffy Counts; Cow Dog Song; Harvey Kneeslapper; learning opposites with Soft & Loud; Hand & Pencil Draw Telephone and loads of other timeless moments from the 7th season. Starring the Chaplin Exit Door; Touch Song; I in the Sky; superstar Lily Tomlin in Count 1-5; Cookie Monster in the Library and many more classic skits! * Buffy Sainte-Marie: "Wynkin, Blynkin, & Nod"
Easter egg: A girl prepares for the snow. With pinball animation #4; a stirring song from Kermit; Making Noodles; Water Foundation and heaps more fun memories! Taking center stage are Bert & Ernie with What Time is it? ; Billy Jo Jive boogying along as she searches for her missing wig; the Nose Blower sketch and more!